Find hotel near Monument Of The Tropic Of .. The monument was originally built in the 34th year of Guangxu Emperor Reign. 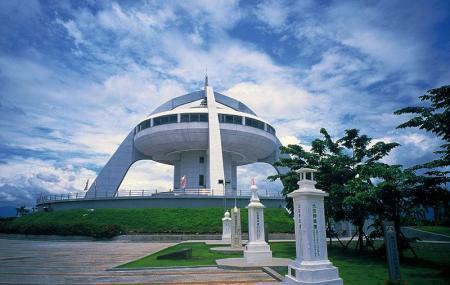 However, the current building was built in 1995 and this monument is located along the Tropic of Cancer line which cuts through Taiwan. An interesting place to take your kids to as the solar exploration tower has some science experiments which they will like. NASA space-related information here will entice your child’s imagination. The 3D movies and the astronomy classes here can be attended by your family. Walk around the monument, click photographs and add a few things to your encyclopedia. Explore Monument Of The Tropic Of Cancer and other prime spots of the city using Beigang Township trip planner. You can add cozy hotels in Beigang Township like Sankaikan Hotel, Very Good Motel and Chia Shih Pao Hotel. Explore the best Beigang Township vacation packages that will take to you important landmarks of the city! For getting in, check out how to reach Beigang Township.